Whether you are a small business owner, a start-up entrepreneur, or a corporate marketer, growth hacking is an indispensable skill set for achieving rapid success on a limited budget. This two-day workshop gets you instantly productive. Best suited for business people and marketers with only a basic knowledge of digital, Growth Hacking 101 will jump-start your exploitation of all the available tools and techniques – without you having to be technical! Growth-hacking is one of the most in-demand skills today. In job ads on AngelList, “growth hacker” is specified as a required skill twice as often as “online marketer”. Growth hacking seeks to grow active consumers of your brand – quickly and inexpensively. It focuses on sales. It converts awareness into purchasing, purchasing into sustained consumption, consumption into ongoing endorsement, and endorsement into purchasing. Professional growth hackers integrate conversion rate optimisation, UX, ad optimisation, analytics, email, and social media in a systematic rapid evolution process continuously fine-tuned through testing and experimenting. That’s quite a mouthful if you are new to digital marketing. But by the time you complete this two-day workshop, you will be totally comfortable with the core concepts, the essential processes and the most accessible tools. What is more, you will be well on your way to implementing growth hacking in your business. The two day format and small group approach allows time for applying the ideas to your brands and business. So bring your laptop! Growth hacking emerged on the back of the app-based start-up bubble, where success is measured by the rate of growth of your active user base. But it has gone way beyond that. Now any business with a digital component has to master the tools and tactics of growth hacking to stay competitive. 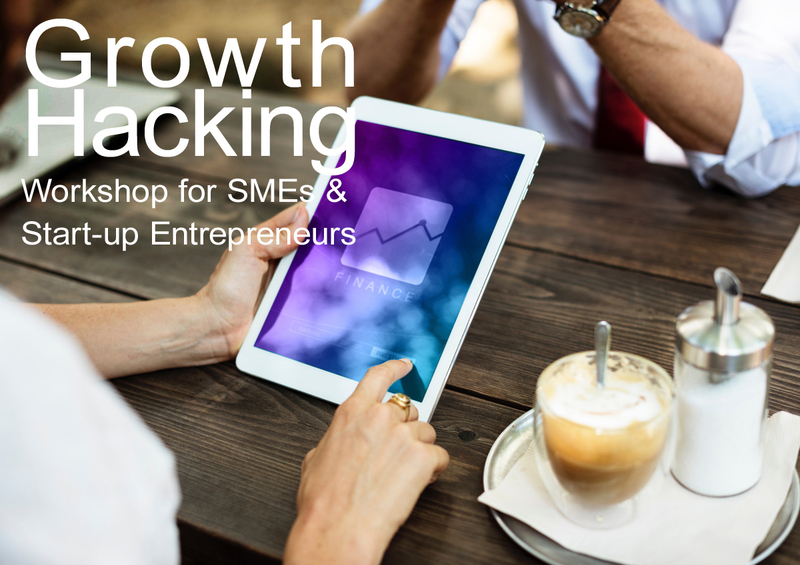 Whether you are an SME company owner, a start-up entrepreneur, a consultant or agency, or a career marketer in the corporate world, Growth Hacking 101 will get you grounded, inspired, and productive. The workshop is crafted for non-technical business people as well as those techies who want a commercial, competitive perspective. The workshop is growth-focused, practical, and empowering. It provides up-to-the-minute insights into the concepts and culture of growth hacking. It identifies and demystifies the most effective parts of all your digital channel options. It challenges the hype of social media, and reveals more powerful ways of exploiting trending and niche platforms. And it provides you, step by step, the methodologies and ground rules for success in rapidly growing your brand. You’ll learn how to integrate all of the most persuasive elements of digital marketing into a growth-centred road-map. How to integrate and leverage network marketing, customer insights, analytics, social media, search marketing, email and a lot more! You’ll leave equipped with a set of tools, hacks, strategies and tactics, inspiring examples, and guidelines for growth hacking your brand. The workshop is led by Godfrey Parkin, author of the best-selling books “Doing Business Digitally” and “Digital Marketing: Strategies for Online Success” and host of the “Growth Hackers” TV talk show. He has founded disruptive digital start-ups in Europe, the US, Africa and Asia, and ran the global business services operation of international market research giant AC Nielsen for many years before that. He has taught strategy, innovation, analytical marketing, growth hacking, social media and e-marketing in more than three dozen countries. Fee: Public workshop R6,800 per person. Fee includes VAT, lunch, refreshments, workbook and certificate. Our in-house team boot camp for 6 or more participants receives a 10% discount. Johannesburg, Durban, or Cape Town. Excellent material presented in an easily understandable way. Money well spent! Exactly what I've been looking for and what our company needed! Enlightening and powerful in its simplicity! Enormously helpful if you are in the tourism industry! Informative, relevant and commercially vital. Clear, simple. Opened up a new world of opportunities! Shares a wealth of experience delivered effortlessly and brilliantly. Thank you for such a powerful Social Media Boot Camp - Wow! What unbelievable value, already seeing great activity on my new Facebook page! Inspired and encouraged by the solid, well presented course, this Boot Camp is worth doing, don't miss the next one! Godfrey is breathtakingly brilliant on social media strategy. He is a limitless source of deep insights as well as being helpful and supportive. He revolutionized my social media marketing approach with fantastic results. Very informative! Very helpful! Very inspiring! Very business orientated. Karen is a great facilitator and very engaging! I believe this has changed the course of my career. Value for money is hopelessly inadequate to describe what I took from this workshop! LOADS of take-aways! Very practical! I have never come across such a brilliant course presenter. I’ve learnt so much! Karen tailored the course to suit us, and is very responsive. One day is not enough… I would have stayed for days if there was an opportunity. Great facilitator – so interesting, helpful, inspiring – I can do this now! Good overall description of e-marketing landscapes and tools. Very thorough presentation. The supporting documentation is very impressive and well researched. I'll make sure to keep it handy for future reference. Well informed facilitator. Content is fresh and up-to-date. Exceptionally relevant and informative. Gave me lots of food for thought. Quality of content. Presentation. Personal touch and interaction. Exercises. All well put together, interesting and insightful. I loved Godfrey's friendly informal and professional way of sharing his knowledge with us. I feel like I can walk away and practically implement what I have learnt. Current, up to date, we were all able to interact and participate. One of the best presentations, I have been to, not too much to improve at all. Excellent value!!! Your courses are always relevant and practical. It makes me excited to go out and start doing it! I like the fact that all the courses are very interactive. In the Britefire courses I have attended, I learnt many invaluable things/tips/secrets to give me the extra edge I can now apply at work. I do like the way of teaching of Britefire. That makes you understand what you want and what you really need. I have gained some great insights that we can use within our business. It does mean some changes in perceptions internally. Cutting edge information to give you a jumpstart. I feel that I got more than I paid for - a terrific amount of information. Exceptionally well presented and very inspiring. Excellent content. Explained really well. Really helpful demos & online working examples. Patient in answering ... questions. Very Informative. Excellent interaction and lecturer is good at bringing peoples background and field of interest to light and binding it in the discussion. It enlightens you hugely to the brilliant opportunities present in the digital realm. If any business wants to be at their best and maximise their profit ,they need to tap into the opportunities present online. It is essential to develop e-marketing skills - we all know that it is a maze with directions written differently by every expert. This is presented professionally, expertly, is current and understandable! Thank you! Lots of valuable info in a compressed form. For anyone who needs to get up to speed this is great. Educational, informative, enlightening and added value to our current strategy. It's amazing - we need to grab the technology that's available by the hand & grow with it. Gives you all the relevant tactics, tips and background information to be able to optimise what you are currently doing. Made technological subjects that are generally not that easy to understand very easy to understand. Very informative. Course leader is very knowledgeable. I found the course very informative. It helped me think about new and exciting ways of marketing online projects and streamlining our processes. One of the most informative & interesting courses I have attended. Brilliantly presented by an extremely knowledgeable and current presenter. So much valuable insight, practical examples. In 1 word - GREAT. Up to date in terms of hottest trends etc. On top of what is happening. Really NB in industry that moves and changes so quickly. I feel like a child at Christmas! So many wonderful tools to implement. Wonderful guidelines and complete structures. I can’t wait to do what I've always done before, but with confidence and knowledge that I have covered every possible aspect of a web project. Truly ecstatic! FAN - TAS - TIC. Rock on Britefire! Informative and enlightening. Powerful in its simplicity. Godfrey is thorough and very knowledgeable, approachable and flexible. Well structured - Concise - Objectives met - Thoroughly presented - Phenomenal industry knowledge - Handy tips. Concise and in-depth view of the theoretical and practical applications of the methodologies in an industry that is constantly changing. Eye opener and extremely informative. Thank you for giving ideas of what we can do, in the companies we're with. It is definitely a useful course for those unfamiliar with web PM & project management overall. The detail provided will prove very useful for wanting to improve upon implementing a process. Personally, the info provided will go a long way towards my engagement with my team members -to ensure better cohesion. User-friendly content. Excellent explanations, great examples shown. Interesting anecdotes & real life examples. This course as the others, were incredibly enlightening and so many new tactics can be applied. A real eye opener, I’d love to do more courses on e-marketing. Mainly gave me confidence to go back to office & be more assertive that I know what I am talking about!! Filled in the 'whys' - etc. on my general background & understanding. Brilliant - so insightful & necessary for any marketer or business. Easy to understand content & great links that are useful. I have learned so much, the information is practical, usable and poignant to our industry and will most definitely help me understand the needs we have in e-marketing. Thank you so much for facilitating the course yesterday, it was so informative and so so empowering.We can all make a valuable contribution to our companies by deploying the skills learned. Very informative. Very helpful. Very inspiring. Very business orientated as well as success driven. I suddenly can't fathom how it is that companies can thrive without applying at least the basic principles of PM. Invaluable! Thanks so much. Brilliant course, very insightful!! I feel very equipped - digitally! Even though colleagues may not use analytics, it's good for the team to understand the power of analytics and reporting to improve performance, not just for interest. Working with Facebook and Twitter for a while now, I learnt how to add value to these pages in ways I'd never thought of. The course also introduced me to many apps that will be hugely beneficial. The course is content and knowledge rich, being a self-taught information architect I was so enlightened by all the really useful lessons I have learnt. It is definitely going to make a huge positive impact on my work performance!! I could have never really learnt all these lessons without the face to face facilitation that Karen gave us. This experience has made me totally rethink how I am going to take my company into the future. Incredibly valuable.